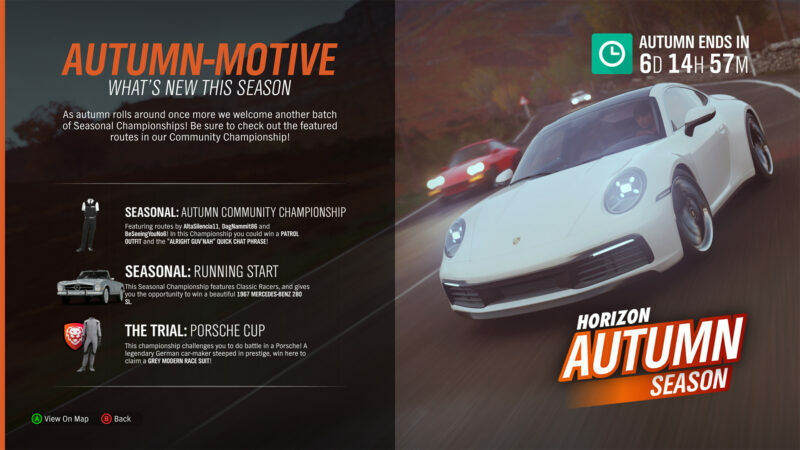 It’s that time of the week again: a new season has come to pass in Forza Horizon 4. 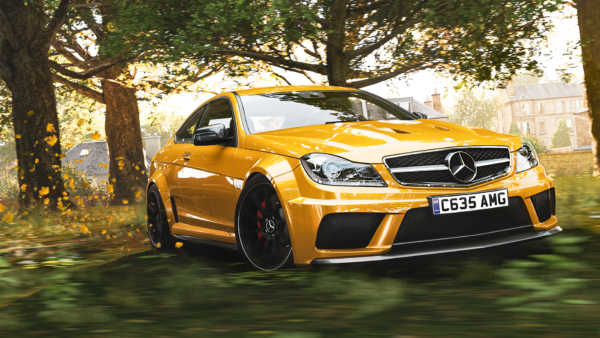 As the leaves fall once more, players will have plenty to keep them occupied. 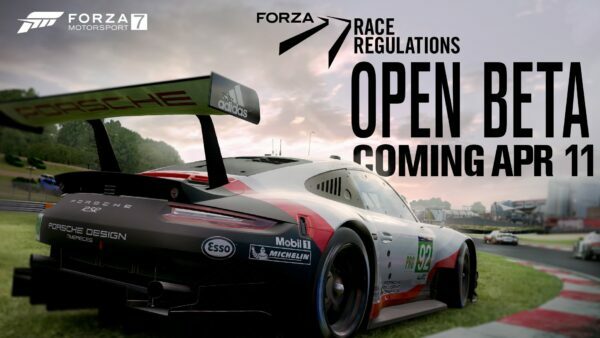 That is to say, as per usual, there are new events to take part in and new prizes to go after. With autumn serving as the perfect season for scenic driving, let’s get down to what this week has to offer. Kicking things off this week are two new toys to explore the UK in. While the two cover extreme ends of the spectrum, there’s no denying heads will turn wherever you go. 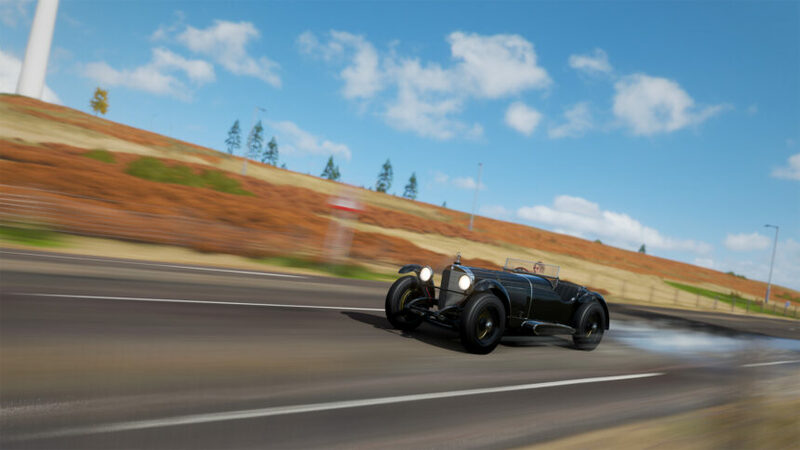 Up first is the 1929 Mercedes-Benz SSK Barker Roadster. A classic through and through, there’s no bad angles on this Benz. In fact, next to the MG TA Midget introduced two weeks prior, both are a collector’s dream. Fewer than 40 SSK models saw the light of day during its production run. Of those, roughly half crossed the line as a racing model. It should come as no surprise then that the few in-tact models remaining command a high asking price. Powered by a monster 7.1-liter straight-six, the SSK made anywhere between 200-300 horsepower. With a top speed of 120mph, it was the fastest car of its time. Don’t be afraid to get down and dirty with this classic, it can definitely handle it. Bonus points for looking good while doing it! 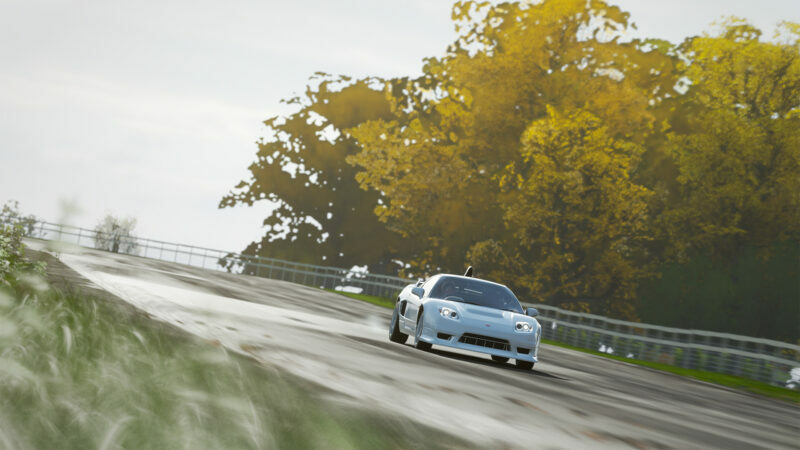 Next up is a returning face from the Xbox 360 era, the Honda NSX-R GT. What is there to say about this NSX, dialed up to 11? Following the facelifted NSX-R, Honda sought to create a more extreme variant: the GT. Why? 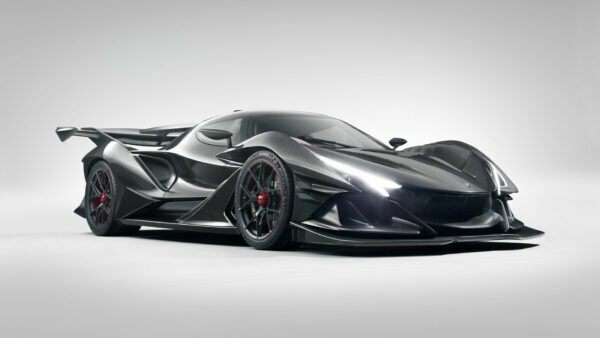 To comply with Super GT homologation rules. The result was a super-limited production run of just five NSX-R GT models. The standout addition — literally — is a non-functioning snorkel attached to the roof of the car. A lowered suspension and widened body are also apparent, as is the extended front spoiler lip and rear diffuser. While limited to Japan in the real world, there is no such restriction here. Power comes from the same 3.2-liter V6 engine sending nearly 300hp to the rear wheels. With a top speed a little under 175mph, you’ll get where you need to with little trouble. Along with this week’s new toys are a host of new events to take part in. 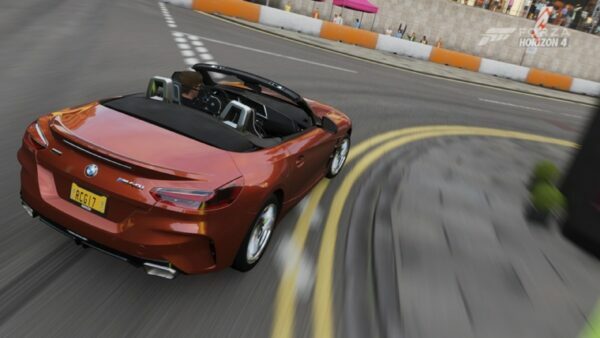 This week is worth keeping an eye on as another returning face lurks, the Mercedes-Benz 280SL. 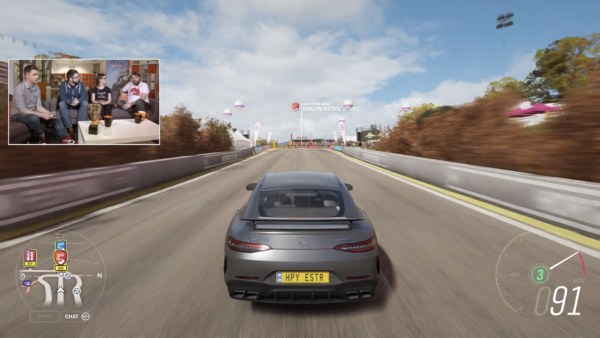 Making its series debut in Forza Motorsport 6, the returning Benz is yours if you claim top honors in a championship event. 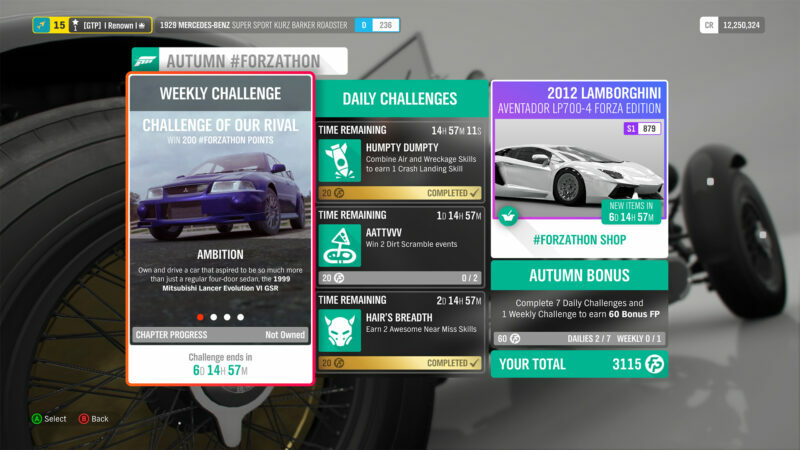 This week’s Forzathon events puts the spotlight on the returning Mitsubishi Lancer Evolution. The first task is as simple as ever: own and drive the ’99 Evolution VI GSR. Next up, you’ll be pushing the car to its limits as you’ll need to rack up 12 stars across Speed Zones. For a car steeped in rally racing, this will be a cakewalk. Third step is, again, right up the Evo’s alley: win five Dirt Racing Series events. 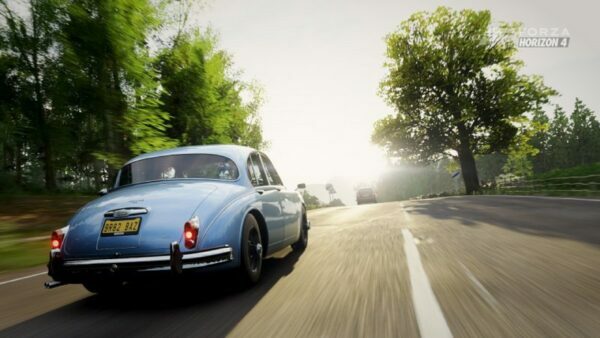 Finally, after reigning supreme in the rally-bred monster, go out for a leisurely drive. Rack up 10 miles on the odometer and you’re as good as done. 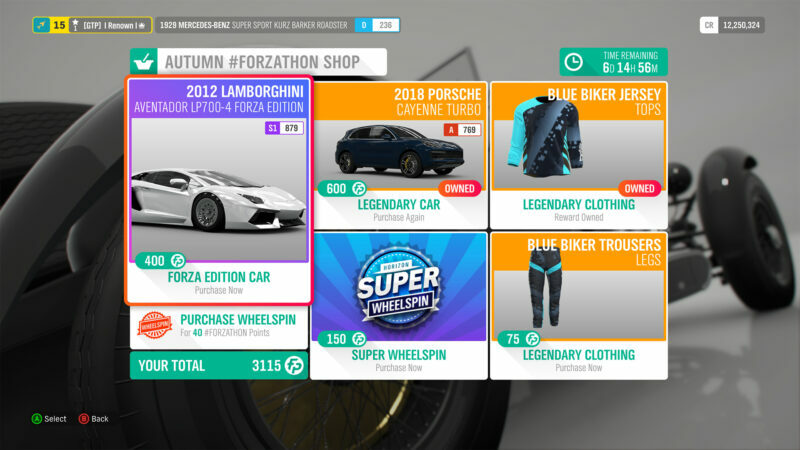 This week’s Forzathon shop is on the expensive side, perhaps the most expensive yet. The featured vehicles cost 1,000 FP alone — like we said, this week is plenty expensive. The 2018 Porsche Cayenne Turbo goes for a cool 600 FP. Unless this is a must-have on your list, we’d suggest trying you luck in the Auction House instead. Better still, grab a few normal and Super Wheelspins and try your luck there. 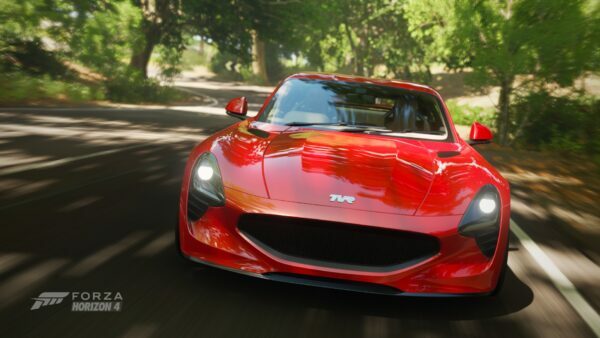 The Forza Edition car is a little more intriguing. Up for grabs is the 2012 Lamborghini Aventador LP700-4 with a Speed Skills boost. 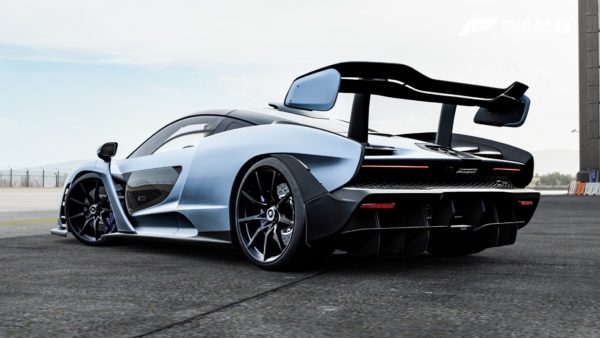 A 217mph supercar with a Speed Skills perk, need we say anything more? While cheaper than the Cayenne Turbo, the price is still steep at 400 FP. No new barn finds this season, but you have the chance to take another swing at the autumn seasonal rumor. As usual, we won’t spoil the surprise but it’ll fit right in with the rest of the crowd. You could even say it would make British and Italian fans alike quite proud.